The scrap wood pile: if there were ever a universal symbol of a DIYer’s unwavering optimism and belief that trash can be useful, this is it. We all have them, and we all know why we keep a random pile of wood around. It’s because we’re certain—with 0% chance of admitting we might be wrong—that someday, there will be a project that requires the use of one or two more pieces of wood. And without this lovely pile of things long-discarded, we would be completely screwed. No, wait. We could just go to the store and buy another piece of wood. All delusions aside, like most DIY fanatics, I too have a collection of scrap wood in my garage. And, seeing as how we all seem to not ever get around to making something out of this mess, Sandra from Sawdust Girl issued a challenge: just this once, why don’t we all actually get around to making something out of that scrap wood for a change? So, I did. First off, this stupid trash can idea: do not do this. A trash can full of unfinished wood is Splinter City. It’s a dumb way to corral the wood because it wedges everything in place and I can’t see what pieces I have. 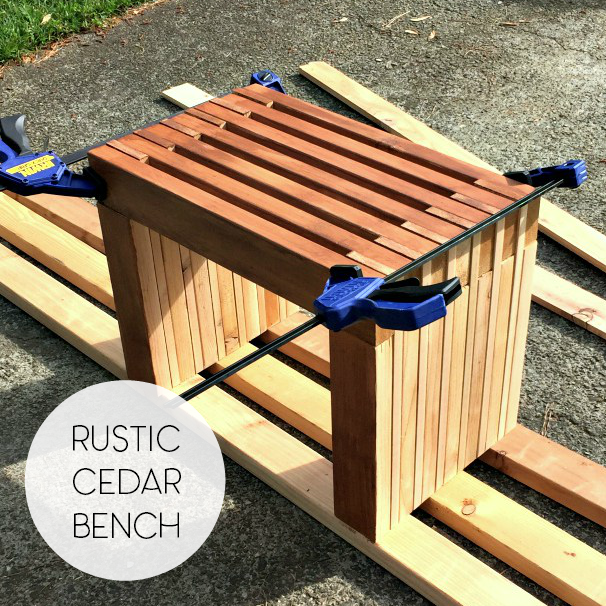 Soon, when the master bathroom is done and the new vanity and toilet are no longer being stored in the garage, I’ll have the room I need to build a mobile lumber cart with a designated area for scrap pieces. Moving on [she says, still giving the evil eye to the splinter bucket]… this sCrap wood challenge is pretty simple: use what you got; create something awesome. No new wood could be purchased, but reclaimed wood, branches, etc. are all fair game. And even though I originally intended on using my leftover walnut from my butcher block counters to create a bar along the wall in the kitchen, that project still needs a little longer to come together for the long-haul. So, I figured I’d try my hand on a project I’ve been wanting to tackle for a while. 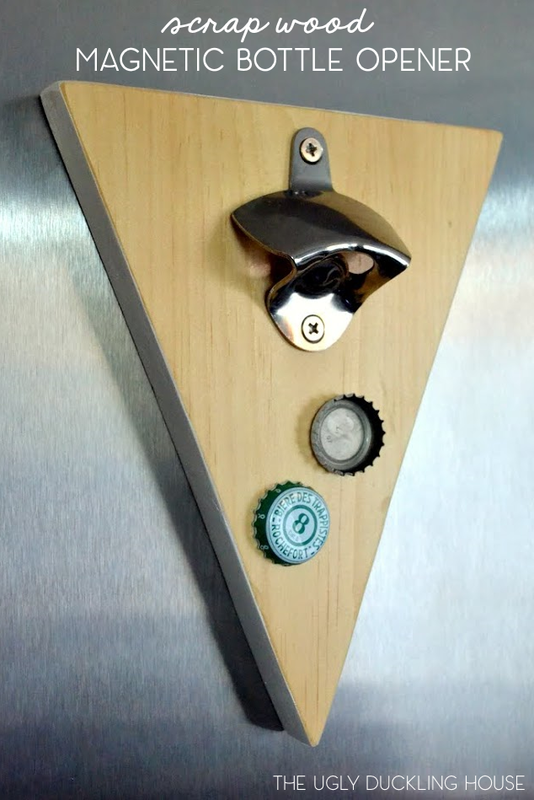 Prior to attempting this project, I researched several DIY magnetic bottle opener tutorials (like this one… and this) online. I also noticed that almost all of them have the same general shape of a long rectangle around 8-10 inches long. Nothing is inherently wrong about this design, but I wanted to try something different and have it better match my kitchen’s style. So, I set out for one circular opener and one triangle shape to see if they could still do the job and look a little more “me” in the process. I haven’t seen any bottle openers that come in a different shape like these, so I had to try it! I started with the circle version, which wound up being the harder of the two. To create the shape, I just traced around a bowl and cut it out. Also, I seem to have zero talent for creating circles with a jigsaw. I had a few uneven spots where the blade got away from me (yes, the same jigsaw where this happened, so I probably should have known better), so I had to spend a while with wood putty and sand it into a rounder shape. (Speaking of sanding… has anyone ever done this? The triangle version was much easier. Starting with a square edge of a piece of 1×8 pine, I measured about 9 inches down from the top and marked the board halfway. I then used a straight edge from each corner to the middle point t create my triangle. Since my miter saw doesn’t slide, it wasn’t perfect, but I filled along the sides of both pieces with wood putty and then used 60-grit sandpaper to shape. I then gradually continued shaping and smoothing out the wood on the top and sides with 120 and 240 grits as well as sanding the corners to take on a more rounded edge. Next: staining. For the pine triangular piece, I chose not to stain it. For the circle, I used two different stain colors: in Burnished Walnut, and when that proved to be too light, I used two light coats of ZAR in Modern Walnut. I’m not very patient when it comes to paint drying, so I pressed on as soon as possible and drilled the holes for the magnets. Since I used two different-sized magnets for this project (I was thinking that a larger one for each would be better for magnetizing), I therefore used two different bits. At first, I thought I would use spade bits (many tutorials I read had done this), which most homeowners have whenever they buy a large set of bits, but I soon realized that because the pieces of wood I was using were so shallow, a spade bit would poke through to the front of the wood (because the shape of spade bits have a long centering point). To avoid this problem, I upgraded my bit collection to a set of Forstner bits, which bore flat-bottomed holes without the use of a long point. Once all the holes were drilled, I used a strong glue to hold each magnet in place. Since magnets can be stuck together to have an even greater pull force, I doubled up each one. I had a bunch of ceramic magnets already at home left over for use in a different project, so I wound up using these. These wound up working okay to hold the piece onto the fridge and catching bottle caps, but if I were to do the project over again (or if I wind up replacing them), I would instead use rare-earth magnets because they are much stronger. The edges were painted a high gloss white with a small paint brush, and the tops were sprayed with a non-yellowing gloss spray sealer. After drying, it was a simple matter of attaching the bottle openers to the front and testing them out (quality control tip: always test the result anywhere from two to three beers, just to make sure it works… no judgment here). All in all, I used 2 large magnets per piece and about 10 of the smaller ones, all clustered together along the back. The magnets are strong enough for the bottle opener to attach itself to the fridge, but you can also drill another hole with the Forstner bit at the top to give it a place for a screw to hook onto. There you have it! This would also make for a great holiday gift, especially since it can be personalized (add lettering, change the color around the edge to match your decor, add a stencil or pattern to the magnetized area, etc). As for my own preference, I like the triangle one better for myself, so I’m likely going to give the round one away to a friend (though I’ll probably upgrade the magnets before I do that). Also, in testing out both of these, I noticed that the brushed stainless steel bottle opener that I used on the round version works a lot better than the polished one on the triangle, which was disappointing since I like the look of it better and the screws were better quality (the brushed stainless ones stripped really easily). I found a gold/brass one I also liked through Rockler, but haven’t yet purchased it. UPDATE: Another snap I caught of the two at night. I still like the triangle version best, but the round one is growing on me! 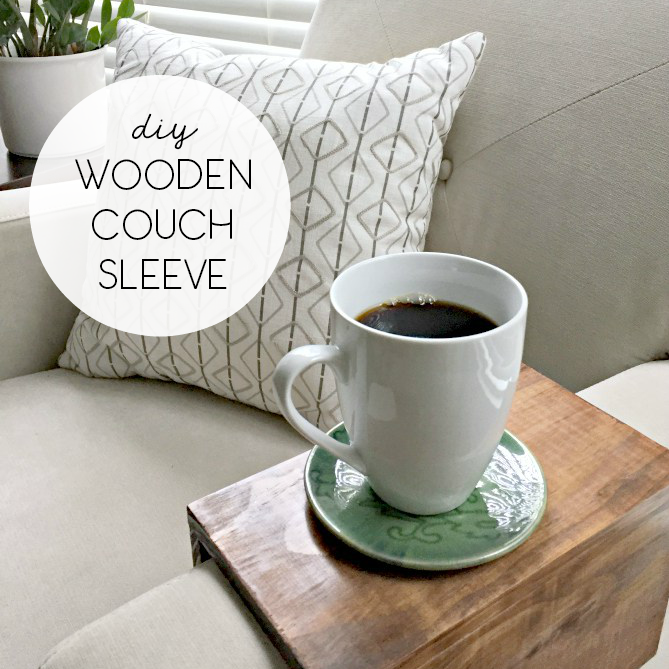 There are lots of things to do with scrap wood! Check out these ideas below (click on the image or the link to be taken to the tutorial). 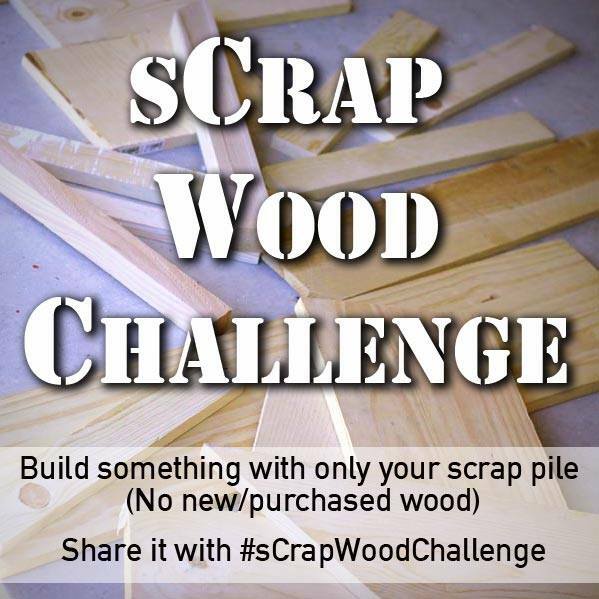 Do you have any scrap wood around the house? What are you planning to do with it? If you feel like taking on the challenge, you have a few more days to link up to those participating. Check out the other clever entries below! 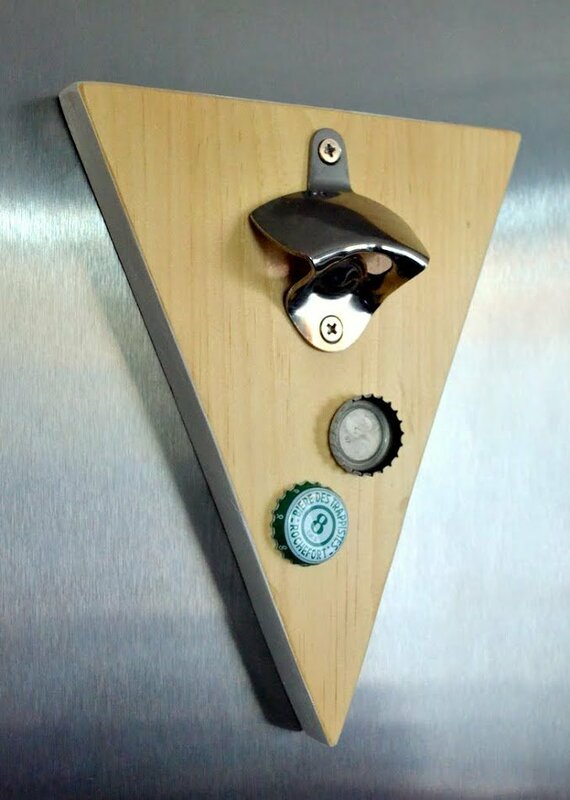 OOOhh I have a hankerin’ to get a big magnet and a bottle opener and make one of these. I actually bought a lion head bottle opener a while ago but haven’t put it on the wall yet. Mainly because I didn’t want the caps falling on the floor or to have a basket hanging under it. Problem solved! Thank you ver much! You got it! That lion head sounds cool. My dad got me a bulldog (college mascot) one that I plan to use for the patio. Sarah, I love your take on these! The geometric shape idea is great brilliant. Way to take a new slant on it! 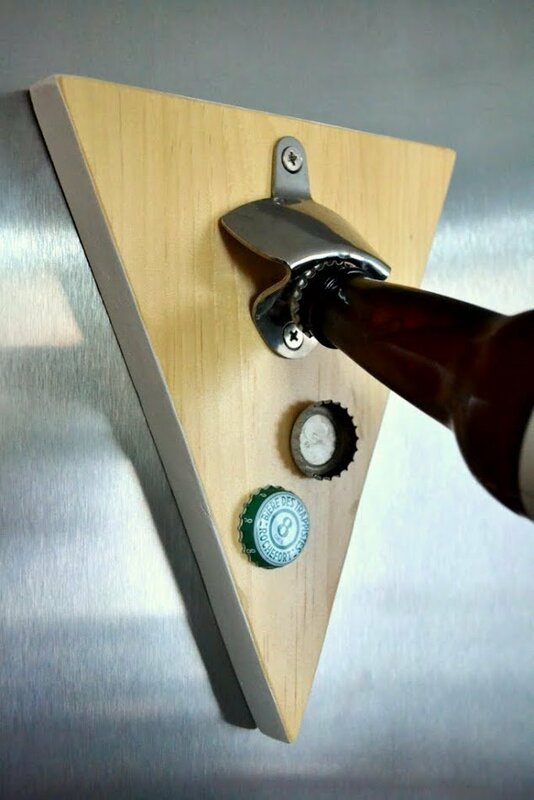 super job with your bottle opener. At least I’m in good company, right? I HATE waiting for things to dry!